With clear, emerald waters and white sand beaches, the town of Gulfport on the Mississippi Gulf Coast draws in many visitors, especially families, each year. Theme and water parks as well as watersports equipment rentals offer high-thrill activities for the brave, while others can relax on the smooth waters of the gulf on a private sailing charter. The town has a choice of museums, including a children's museum, model train and retro car museums, and even tours of the famous Stennis Space Center. The Institute for Marine Mammal Studies is an organization devoted to research, conservation, and education in the sphere of marine mammal biology and ecology along the Gulf Coast. Behind the scenes, the institute conducts important research on animals from this region and cares for and rehabilitates sick and injured animals. The group also runs the Center for Marine Education and Research, which creates educational displays based on the animals with which the institute works. The center is very hands on, featuring touch pools and a fossil dig. Guests can also participate in encounters with dolphins and other marine mammals and view related presentations. 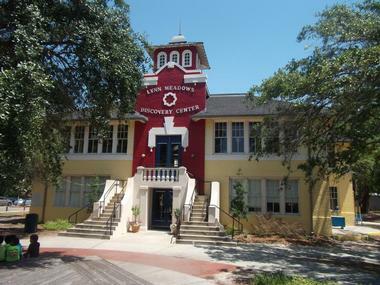 Lynn Meadows Discovery Center, Mississippi's first children's museum, promotes learning and development through fun, interactive exhibits. The center has 15,000 square feet of indoor displays, plus six outdoor spaces where kids and parents can laugh, play, and explore together. The areas of the museum each have a cohesive theme such as art, animals, cooking, the nearby port, history, and science. The facility also includes a tiny outdoor library booth from which children can borrow books. In addition to regular visits to Lynn Meadows, families can participate in cooking and performance classes as well as camps with various areas of focus. 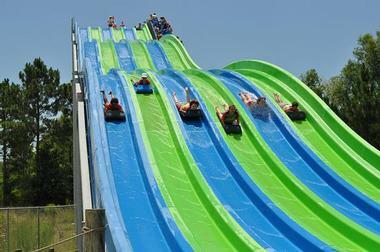 Gulf Islands Water Park, a seasonal waterpark and recreation center, has miles of water slides and an exciting program of shows to keep the whole family having fun out in the sun. Thrill seekers can get an adrenaline rush on rides with towering drops and lightning speeds, while the littlest of little ones can splash around in the Ship Island Wreck and Spray St. Louis play areas. Gulfport Dragway brings a little something different to this shore community with its long, straight drag racing track, which supports 1/4- and 1/8-mile races. The dragway, surrounded by trees and greenery, is located a little bit inland. It hosts various kinds of high-speed drag races, including street and footbrake car races and fast-paced motorcycle and diesel truck competitions as well. Spectators root for their favorites out in the open air along the side of the track in an exhilarating, yet family-appropriate atmosphere. While Gulfport Dragway does have concessions for sale, fans are permitted to tailgate at the venue as well. The Mississippi Coast Model Railroad Museum, which is supported by the region's model railroad club, keeps an honored tradition alive in its railroad track and car displays and exhibits. 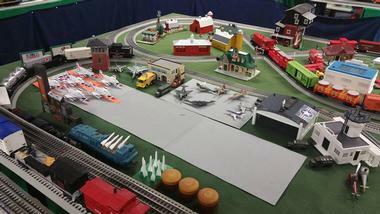 The club has three HO, O, and N table layouts for model railroads and trains as well as five raised G trains for kids. There is even a LEGO train set complete with its own model town. Patrons can come for regular museum visits or utilize the space for birthday parties. At these events, both the young and the young at heart can ride the museum's electric carnival riding train or one of its six Thomas the Tank Engine riding trains. 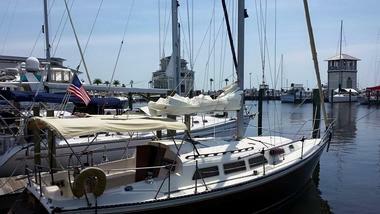 North Star Sailing Charters is a private charter sailing company situated at the Gulfport Small Craft Harbor. Its two sailboats, the 40-foot Kashmir and the 31-foot Polaris, take guests out on private charter trips along the Mississippi Sound and the Gulf of Mexico. Each charter can take up to six passengers, and many packages are offered, including daytime, sunset, and moonlight cruises, trips for dolphin and pelican watching, and private dinner cruises catered by a local Gulfport restaurant. North Star allows for flexible start times, and they let clients customize their charter to their needs. The company also offers sailing lessons. Set Sail Away takes the charter experience up a notch with its luxury yachts and cruise packages. The company operates three yachts, two of which are large enough to include space for private cabins and room to roam around and enjoy onboard amenities such as couches and television entertainment systems. Set Sail Away cruises can accommodate up to six passengers, and trips can last from a short two hours to the entire day. The boats are equipped with a full crew who make the experience especially high end and comfortable. Different dining options are available, depending on the length of the cruise and the time of day. 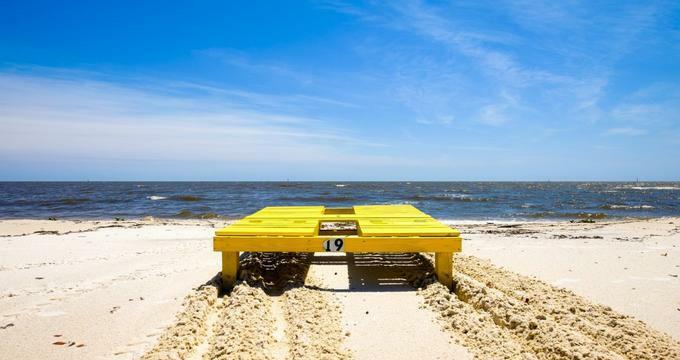 According to Ship Island Excursions, the best beaches in Mississippi are found on West Ship Island, which is located 11 miles south of Gulfport and is one of five barrier islands in the state. In addition to clear waters and clean sands, West Ship Island is home to Fort Massachusetts, a historic brick fortification from the nineteenth century. Ship Island Excursions runs a convenient ferry service that takes visitors to the island so they can enjoy its tranquil natural splendor. The ride lasts 50 minutes, and riders can often see Atlantic Bottlenose dolphins swimming in the transparent waters of the gulf along the way. In addition, for those seeking a more luxurious experience, Ship Island Excursion also has a range of private charter packages for large groups. The Chandeleur Brewing Company was founded by Cammack and Cain Roberds, two Gulfport, Mississippi natives who discovered their passion for fine craft beer in the 1990s. When the pair decided to turn this passion into a business in 2013, they looked no further than their hometown, where they bought the historic building that now holds the Chandeleur Brewing Company. The brewery is located in the downtown area very close to the coast, and it produces a unique selection of beers (including ales, stouts, and porters) using only carefully selected ingredients. Visitors can tour the lively facility to learn about how these unique Mississsippi concoctions are created. Stennis Space Center is an official NASA facility where flight certification and rocket propulsion systems testing are carried out. The complex was initially built in the 1960s in preparation for the major Apollo space project, and since then, Stennis has served as a key testing center in the United States' vast space program. Stennis Space Center has a dedicated visitors area known as the INFINITY Science Center. Here, guests can dive into interactive exhibits that focus on the history of space exploration, STEM topics, and other interesting themes. From INFINITY, guests can take a bus tour of the part of Stennis Space Center that is open to visitors. Affiliated with Mississippi State University, The Crosby Arboretum is an important educational center that works to preserve and educate the public about many of the plants native to the Pearl River Drainage Basin. In addition to its research efforts, the arboretum has a pavilion, seven natural areas, and three main curated ecological displays: the Savanna, Aquatic, and Woodland exhibits. Each of these exhibits incorporates flora from the region and provides background information about the habitat. Visitors can walk through the center on their own using the trail signs to create a self-guided tour, or they can sign up for a staff-led tour of the grounds. The Busted Wrench Garage Museum, often shortened to the smoother abbreviation “B.W.G.,” is an exhibit filled with one of the country's most iconic treasures: classic American cars. John Hans, who himself loves retro vehicles and wanted to put them on display for visitors to the Gulf Coast of Mississippi, founded the museum in 2008. The 6,000-square-foot exhibition space at the B.W.G. presents authentic vintage cars, motorcycles, and boats. Guests can see the displays up close and admire the antique paraphernalia on the walls, which includes posters, license plates, and other pieces. A fully stocked gift shop furnishes a wide assortment of car-related items for purchase. A trip to Gulfport is incomplete without time spent out on the smooth waters of the Mississippi Sound, and the Making Memories Sailing charter company provides a number of ways to do just that. Making Memories Sailing operates its own yacht, the Kahlua, a 33-foot classic sailboat that has been recently restored. Captain Roger takes guests out on charters of varying lengths; options include a sunset cruise (two-and-a-half hours), half-day cruises in the morning or evening (four hours), and full-day six-hour cruises. The boat has convenient places to sit both on and below deck, and passengers can soak up the sun and seawater spray and perhaps even meet some fish or dolphins on charter. 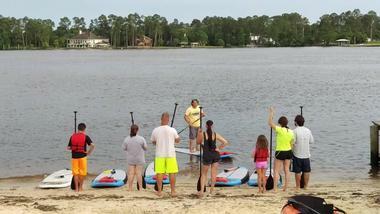 Wut SUP Standup Paddleboards & Rentals gives visitors a new way to see the Gulf Coast on a standup paddleboard, or SUP. The mission of the shop is to spread the joy of paddle boarding by giving visitors everything they need to get out on the water—a board, leash, bag, fins, and paddle, plus lessons from their staff instructor. The shop is located near both the gulf and Gulfport Lake, making either one an option for an exciting paddleboard adventure. Wut SUP also rents and sells kayaks, bicycles, and skateboards, and any equipment they offer can be delivered to local accommodation. 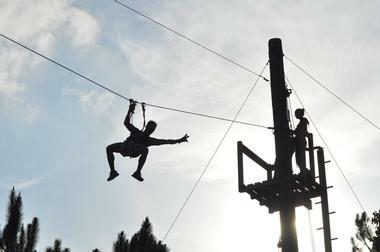 A trip to Zip'N Fun Adventure Park is sure to be a challenging, active, and fun experience. Unlike other coastal attractions in and around Gulfport, Zip'N Fun takes its guests up to the treetops, where they complete an obstacle course made up of fifty games. Visitors wear harnesses and make their way to high platforms, where they then have to cross challenges like tight ropes, swinging logs, unstable rope bridges, and more in order to complete the course, which increases in difficulty as players move through it. In addition to its tough obstacles, the Zip'N Fun course also has several zip lines for bursts of adrenaline along the way.